is a science writer and works as an honorary research associate at La Trobe University in Melbourne. Her latest book is The Memory Code (2016). She lives in Castlemaine, Australia. In Arthur Conan Doyle’s detective novel A Study in Scarlet (1887) we learn that Sherlock Holmes used the most effective memory system known: a memory palace. Although imagined memory palaces are still used by memory champions and the few who practice the memory arts, they are best known from Greco-Roman times when great orators, including Cicero, used them to ensure their rhetoric was smooth, detailed and flawless. The physical memory palace, usually a streetscape or building interior, would become so familiar to the orator that it was always available to them in their imagination. By ‘placing’ one piece of information in each site, they could mentally stroll through their memory palace, location by location, drawing out each portion of the speech in the required order without missing any element. Received opinion is that this method of loci, as the technique is also known, dates to before Simonides of Ceos (c556-468 BCE), who is often credited as the inventor. However there is ample circumstantial evidence that indigenous cultures the world over have been using it for far longer than that. There is a continuous record dating back at least 40,000 years for Australian Aboriginal cultures. Their songlines, along with Native American pilgrimage trails, Pacific Islanders’ ceremonial roads and the ceque system of the Inca at Cusco all exhibit exactly the same pattern as the memory palaces described by Cicero. At each sacred location along these paths, elders would sing, dance or tell a story, all making the information associated with the location more memorable. The memory skills of indigenous elders exceed anything reported for the ancient Greeks. Research with the Native American Navajo people, for example, shows that they memorise a classification of more than 700 insects along with identification, habitats and behaviour. And that’s just insects. A fully initiated indigenous elder would be able to relate stories equivalent to a field guide for all the birds, mammals, reptiles, fish and hundreds of insects within their environment. Another study shows that the Hanunoo people of the Philippines were able to identify 1,625 plants, many of which were unknown to Western science at the time. Add to that knowledge of astronomy, timekeeping, navigation, legal and ethical guidelines, weather and seasons, complex genealogies and belief systems, and you have a vast encyclopaedia stored in an interwoven memorised web: a web that is tied to a real or imagined memory palace. Cultures without writing are referred to as ‘non-literate’, but their identity should not be associated with what they don’t do, but rather with what they do from necessity when there is no writing to record their knowledge. Cultures without writing employ the most intriguing range of memory technologies often linked under the academic term ‘primary orality’, including song, dance, rhyme and rhythm, and story and mythology. Physical memory devices, though, are less often included in this list. The most universal of these is the landscape itself. Australian Aboriginal memory palaces are spread across the land, structured by sung pathways referred to as songlines. The songlines of the Yanyuwa people from Carpentaria in Australia’s far north have been recorded over 800 kilometres. A songline is a sequence of locations, that might, for example, include the rocks that provide the best materials for tools, to a significant tree or a waterhole. They are far more than a navigation aid. At each location, a song or story, dance or ceremony is performed that will always be associated with that particular location, physically and in memory. A songline, then, provides a table of contents to the entire knowledge system, one that can be traversed in memory as well as physically. Enmeshed with the vitalised landscape, some indigenous cultures also use the skyscape as a memory device; the stories of the characters associated with the stars, planets and dark spaces recall invaluable practical knowledge such as seasonal variations, navigation, timekeeping and much of the ethical framework for their culture. The stories associated with the location in the sky or across the landscape provide a grounded structure to add ever more complexity with levels of initiation. Typically, only a fully initiated elder would know and understand the entire knowledge system of the community. By keeping critical information sacred and restricted, the so-called ‘Chinese whispers effect’ could be avoided, protecting information from corruption. Rock art and decorated posts are also familiar aids to indigenous memory, but far less known is the range of portable memory devices. Incised stones and boards, collections of objects in bags, bark paintings, birchbark scrolls, decorations on skins and the knotted cords of the Inca khipu have all been used to aid the recall of memorised information. The food-carrying dish used by Australian Aboriginal cultures, the coolamon, can be incised on the back, providing a sophisticated mnemonic device without adding anything more to the load to be carried when moving around their landscape. Similarly, the tjuringa, a stone or wooden object up to a metre long decorated with abstract motifs, is a highly restricted device for Aboriginal men. As the owner of the coolamon or the elder with his tjuringa touched each marking, he or she would recall the appropriate story or sing the related song. 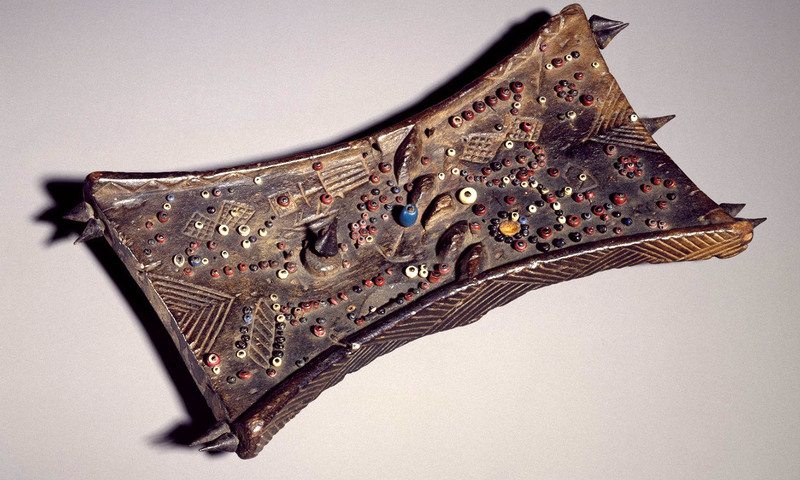 This is very similar to the way the Luba people of West Africa use a well-documented memory board known as a lukasa. Previous researchers have claimed that the ‘men of memory’ of the Mbudye society would spend years learning a vast corpus of stories, dances and songs associated with the bead and shells attached to a piece of carved wood. My initial attitude when I read this was complete skepticism. It was surely claiming far too much for such a simple device. So I made one. I grabbed a piece of wood and glued some beads and shells on it and started encoding the 412 birds of my state: their scientific family names, identification, habitats and behaviour. It worked a treat. I no longer doubt the research. Though simple, this is an incredibly powerful memory tool. Inspired by my success with the lukasa, I have also created songlines for more than a kilometre around my home. I have a location on my walk for each of the 244 countries and dependent territories in the world. I walk through them from the most populous in China to little Pitcairn Island. I also walk through time from 4,500 million years ago until the present, nodding to the dinosaurs, meeting our hominid ancestors and greeting numerous characters from history. My memory has been hugely expanded by using this ancient mnemonic technique. It is the structure of the human brain that dictates the memory methods that work so effectively right across human societies. It is our dependence on writing that has eroded this skill. We can, if we choose to, implement these techniques alongside our current educational methods. I have taught schoolchildren to sing their science and to create memory trails right around the school grounds, with excellent results. We can and should learn from the intellectual achievements of indigenous cultures by adapting their techniques to contemporary life. But when we do this, we should acknowledge the source. These memory techniques are far older than our Western civilisation, and they are far more effective than the crude rote techniques that replaced them.